The development of the G11 rifle was started in the late 1960's, when West German government decided to replace existing G3 rifle with lighter weapon with much better hit probability. The initial studies lead to the idea of the small-caliber, rapid-fire rifle that fires caseless ammunition. To ensure sufficient stopping/killing power for small-caliber bullets used, the rifle should had have the three-round bursts capability and high capacity magazine. The new design, called G11, was created by german company Hecler und Koch, with the Dynamit Nobel company in team. The HK was responsible for the rifle itself, while Dynamit Nobel had to develop caseless ammunition. The rifle features unique cylinder breech/chamber system that rotates 90 degrees. The cartridges in the magazine are located above the barrel, bullets down. Prior to each shot, first cartridge is pushed down from magazine into chamber and then breech/chamber rotates 90 degrees to align the cartridge with the barrel (see pic). After that, the cartridge is fired and the breech/chamber rotates back, ready for the next cartridge to be chambered. In the case of the cartridge ignition failure, the failed cartridge is pushed down from the chamber by the next cartridge. The breech can be manually "cocked" by the rotating handle at the side of the rifle, located beyond the pistol handle. The cocking handle does not move when gun is fired. Another interesting detail is that barrel, rotating breech, feed module and magazine are mounted in the housing that can move in the rifle back and forth. When firing single shots, the housing moves back and forward after the each shot. When firing the full-auto, the housing moves back and forward during each shot, resulting in moderate rate of fire of some 600 round per minute. But, when firing the three-round bursts, second and third cartridges are feed and fired as soon as the chamber is ready for it, and third bullet leaves the barrel PRIOR to the moment when the housing becomes to its rearward position. This results in wery high rate of fire with three-shots bursts - ca. 2000 rounds per minute. Also, this results in that the actual recoil affects the rifle AFTER the last bullet in the burst is fired. Rifle featured built-in 1X optical sight with simple circle aiming reticle. Early prototypes featured one 50 rounds polymer magazine, while latest versions featured 45 rounds magazines - one in the loaded position within the movable housing and two spare magazines on the top of the rifle, asides from the loaded magazine. The caseless ammunition in its early appearance was designed as a block of the propellant, coated with flammable laquer, with bullet and primer "glued on" the propellant. Final ammunition design DM11, that appeared in the mid-1980s, featured "telescopic" design, when bullet was fully enclosed in the block of the propellant. The cartridge propelled the bullet that weights 3.25 gramms, to the 930-960 meters per second. Early prototypes were prone to the ammunition cook-offs during the sustained fire, but later Dynamit Nobel solved this issue. In the late 1980s the Bundeswehr (West German Army) began the field tests of the pre-production G11s. After the initial tests, some improvements were devised, such as removable optical sight, mounting of two spare magazines on the rifle, and bayonet/bipod mount under the muzzle. The modified variant, called G11K2, was tested in 1989, scoring at least 50% better combat accuracy when compared to G3 rifle. Initial batch of some 1000 G11K2s was received by Bundeswehr in 1990 or so, but due to some reasons the whole programme was cancelled by German Government. Main reasons of this cancellation were, in my opinion, the lack of fundings after the re-union of the West and East Germanies, and the general NATO policy for unification of the ammunition and even magazines for the assault rifles. 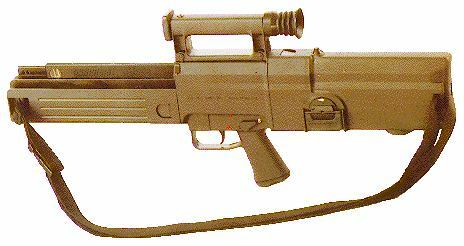 The slightly modified G11 was also tested in the USA under the ACR (Advanced Cobat Rifle) programme, in 1990. The ACR programme was not intended to result in adoption of the new rifle for the US Army, just to test new technologies and designs, and the G11 proved itself as a very accurate, comfortable to handle and fire, and reliable weapon. `HK G11K3 4.7 x 33 serial number`On left of body.